From VOA Learning English, welcome to The Making of a Nation, our weekly program of American history for people learning American English. I’m Steve Ember. In 1850, the northern and southern states threatened to split over the issue of slavery. At that time, owning slaves was legal in the southern states. Many northerners opposed slavery. And the question remained: should slavery be legal in new territories in the western part of the country? The two sides disagreed strongly. But the issue needed to be settled. So Senator Henry Clay of Kentucky offered a compromise. Conservative southern lawmakers rejected it. John C. Calhoun of South Carolina especially spoke against the compromise. But other lawmakers supported it, including one of the nation's top political leaders. Senator Daniel Webster of Massachusetts said the compromise was the only way to save the Union of states. 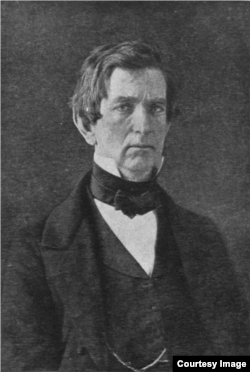 Four days after Webster’s speech, Senator William Seward of New York presented his ideas to the Senate – and to the nation. Seward was a northerner. He said he opposed any compromise with the South. He said he did not want slavery in the new western territories. And he called for a national policy to start ending slavery everywhere peacefully. Seward criticized Daniel Webster for speaking against Abolition societies. He said such groups represented a moral movement that could not be stopped. He said the movement would continue until all the slaves in America were free. Seward then criticized John C. Calhoun. He denounced Calhoun's demands for a political balance between the North and South. He said this forced balance would change the United States from a united, national democracy to an alliance of independent states. In such a system, he said, the minority would be able to veto actions of the majority. A few weeks after Seward spoke, John C. Calhoun died. One newspaper in Calhoun's home state said: "The senator's death is best for the country and his own honor. The slavery question will now be settled. Calhoun would have blocked a settlement." In fact, many lawmakers had come to support the idea of Senator Henry Clay's compromise. But they could not agree on which parts of it to pass first. Southern supporters were afraid that if a statehood bill for California was passed first, then northerners would refuse to pass the other parts of the compromise. So, southerners wanted to include all parts in one bill. A committee of 13 men was named to write a bill based on Henry Clay's compromise. The committee had six members from slave states and six from free states. Senator Clay was named to lead it. Three weeks later, the committee offered its bill. It was much like the compromise Clay had first proposed. It made California a free state. It created territorial governments for New Mexico and Utah. It settled the border dispute between Texas and New Mexico. It ended the slave trade in the nation’s capital, the District of Columbia. And it urged approval of a new law dealing with runaway slaves. 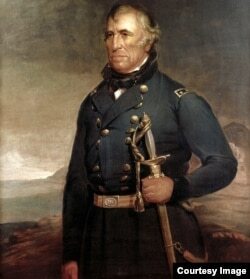 For about a month, the bill seemed to have the support of President Zachary Taylor. But then the president made it clear that he would do everything he could to defeat it. Taylor did not think the nation was in crisis. He did not believe the dispute over slavery was as serious as others did. He had his own plan to settle one part of the dispute. He would make the new territory of California a free state. There, slavery would be banned. Taylor's plan did not, however, settle other parts of the dispute. It said nothing about laws on escaped slaves. It said nothing about slavery in the District of Columbia. It also said nothing about the border dispute between Texas and New Mexico. Senator Clay, who had offered the compromise, questioned President Taylor's limited proposal. Clay said: "Now what is the plan of the president? Here are five problems, five wounds that are bleeding and threatening the life of the republic. What is the president's plan? Is it to heal all these wounds? No such thing. It is to heal one of the five and to leave the other four to bleed more than ever." While the debate continued in Washington, the situation in Texas and New Mexico got worse. Texas claimed a large part of New Mexico, including the capital, Santa Fe. Early in 1850, Texas sent a representative to Santa Fe to take control of the government. The United States military commander in New Mexico advised the people not to recognize the man. The governor of Texas was furious. He decided to send state soldiers to enforce Texas's claims in New Mexico. He said if trouble broke out, the United States government would be to blame. President Taylor rejected Texas's claims. He told his secretary of war to send an order to the military commander in New Mexico. The commander was to use force to oppose any attempt by Texas to seize the territory. The secretary of war said he would not send such an order. He believed that if fighting began, southerners would hurry to the aid of Texas. And that, he thought, might be the start of a southern struggle against the federal government. In a short time, the North and South would be at war. So the secretary of war refused to sign the order. President Taylor answered sharply, "Then I will sign the order myself!" Taylor had been a general before becoming president. He said he would take command of the army himself to enforce the law. And he said he was willing to hang anyone who rebelled against the Union. President Taylor began writing a message to Congress on the situation. He never finished it. On July 4th, 1850, Taylor attended an outdoor Independence Day ceremony. The event was held on the grounds where a monument to America's first president, George Washington, was being built. The day was very hot, and Taylor stood for a long time in the burning sun. That night, he became sick with pains in his stomach. Doctors were called to the White House. But none of their treatments worked. Five days later, President Zachary Taylor died. His vice president, Millard Fillmore, was sworn-in as president. Millard Fillmore was from New York State. His family was poor. His early education came not from school teachers, but from whatever books he could find. Later, Fillmore was able to study law. He became a successful lawyer. He also served in the United States Congress for eight years. The Whig Party chose him as its candidate for vice president in the election of 1848. He served in the office for about a year and a half before the death of President Taylor. Fillmore had disagreed with Taylor over the congressional compromise on slavery and the western territories. Unlike Taylor, Fillmore truly believed that the nation was facing a crisis. And he truly believed the compromise would help save the Union. Now, as president, Fillmore offered his complete support to the compromise bill. Its chances of passing looked better than ever. Fillmore asked the old cabinet to resign. He named his own cabinet members. All were strong supporters of the Union. All supported the compromise. Congress debated the compromise bill throughout the summer of 1850. The bill included several proposals. Supporters decided not to vote on the proposals as one piece of legislation. They saw a better chance of success by trying to pass each proposal separately. Their idea worked. By the end of September, both the Senate and House of Representatives had approved all parts of the 1850 Compromise. President Fillmore signed them into law. One part of the compromise permitted California to enter the Union as a free state. One established territorial governments in New Mexico and Utah. One settled the dispute between Texas and New Mexico. Another ended the slave trade in the District of Columbia. Many happy celebrations took place when Americans heard that President Fillmore had signed the 1850 Compromise. Many people believed the problem of slavery had been solved. They believed the Union had been saved. Others, however, believed the problem only had been postponed. They hoped the delay would give reasonable people of the North and South time to find a permanent answer to the issue of slavery. Time was running out. It was true the 1850 Compromise had ended a national crisis. But both northern and southern extremists remained bitter. Those opposed to slavery believed the compromise law on runaway slaves violated the constitution. The new law said blacks accused of being runaway slaves could not have a jury trial. It said government officials could send the suspected runaways to the individual who claimed to own them. It said blacks could not appeal such a decision. Those who supported slavery had a different idea of the compromise. They did not care about the constitutional rights of blacks. They considered the compromise a simple law for the return of valuable property. No law approved by Congress, and signed by the president, could change these beliefs. The issue of slavery was linked to the issue of secession. Did states have the right to leave the Union? If southern states rejected all compromises on slavery, did they have the right to secede? The signing of the 1850 Compromise cooled the debate for a time. But disagreement on the issues was deep. It would continue to build over the next ten years. How the situation affected slaves themselves will be our story next week. I’m Steve Ember inviting you to join us next time for The Making of a Nation – American history from VOA Learning English.